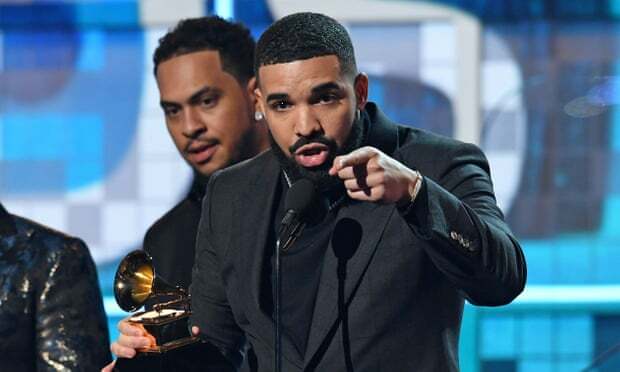 Had Drake not opened his mouth, the Grammy awards might have passed more or less without incident. If it wasn’t overly keen on courting political controversy – accepting her best new artist award, Dua Lipa started talking about the importance of “personal background”, and seemed to be making a point about immigration, but was cut off – it did try to atone for the comments made last year about female artists by the Recording Academy president Neil Portnow, which provoked outrage and a campaign to unseat him. Female solo artists took home a succession of top awards – best album, best new artist, best pop solo performance and best pop vocal album among them. Kacey Musgraves and Brandi Carlile dominated the country and Americana categories, and Cardi B became the first solo woman to win best rap album. Portnow made reference to what he had said in his speech, although the stony response of female artists in the audience, including Lady Gaga and Musgraves, suggested his words were being filed under “too little too late”. Elsewhere, the kind of things you might expect to win Grammys won Grammys – Childish Gambino’s This Is America got both record and song of the year plus best music video; Ariana Grande took home best pop album – and other categories provided their usual dose of WTF? for British onlookers, used to less diffuse awards ceremonies. Take Opium Moon, self-styled purveyors of “karma sutra music … sensual and groovy”, triumphing in the new age category, or the bizarre sight of proggy soft-rockers the Alan Parsons Project taking home an award in 2019, albeit for best immersive audio album.